Building and maintaining your own interfaces to property portals can be a time consuming and expensive exercise. The Sync API simplifies the complexity of interfacing to multiple property portals by providing a single property input structure that is automatically transformed to be used with each portal’s own API. It goes further by providing auto scaling & recovery features to ensure listings are updated as soon as possible. 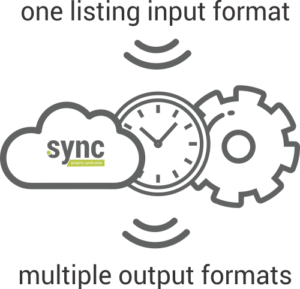 The Sync API is a RESTful web service and exposes various methods for the input or edit of property, office and agent data. Have a look at the Sync REST API documentation here. One input structure: Update listings to multiple portals without having to worry about the specification of any of them. Less maintenance: we handle portal interface problems as part of our service. Auto scaling: We auto scale resources to cater for peak loads. Faster ROI: Simplify your development process and get automatic access to our growing list of partner portals. Flex integration: The Sync API provides access to our Flex real estate websites. High traffic portals: We partner with high traffic portals to deliver more leads to estate agents. Use your current infrastructure: Our team will integrate with your current interface specification or provide a scheduled flat file feed. Customize: For Base users, we customise and market listing package options for users. Billing and end-user support: Can all be handled by our Helpdesk.